Gun Made With 3-D Printer Is Successfully Fired : The Two-Way The almost entirely plastic weapon fires .22-caliber bullets. Critics fear it will make such guns too easy to make and too hard to detect. The designers say it's already possible to make your own firearms and that they're just creating another way. The Texas-based company Defense Distributed is getting quite a bit of attention this week for its Liberator — a handgun made almost entirely by a 3-D printer. The BBC says "the world's first gun made with 3-D printer technology has been successfully fired in the US." There's a promotional video posted here of the gun being tested. Defense Distributed says it's going to post instructions online for how to make the gun (though the 3-D printer it used costs $8,000, a not insignificant investment). As All Tech Considered has reported, the prospect of making guns and gun parts with printers that use robotic arms to build objects one plastic layer at a time is alarming to some. Their fear: the possibility that such weapons could someday soon be relatively easy to make and hard to detect. Defense Distributed sees things differently, saying on its website: "Since [the nation's] inception, it has been legal in the USA to fashion your own firearm, and to talk about doing so. More precise legalities are that it is legal to produce any category of weapon you could ordinarily legally own, so long as you are not providing it for sale or are not prohibited from possessing firearms in the first place. Everything else is free speech, ladies and gentlemen." The Guardian offers some reasons not to be either alarmed or excited about the news, saying that "it's not going to herald an age of widespread weapon ownership, and it's certainly not proof that 3-D printing technology needs to be controlled for our safety. ... The difficult stuff — getting it to fire accurately, repeatedly and without jamming or blowing up in your face — is still a long way off for 3-D printers. And even the best 3-D-printed gun still relies on someone else to make the gunpowder." The Liberator uses standard .22 Long Rifle ammunition. 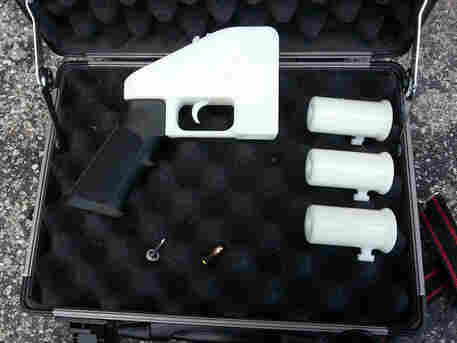 As for the issue of whether this weapon could be smuggled through security checkpoints, Forbes notes that Defense Distributed has inserted "a six ounce chunk of non-functional steel into the body of the Liberator, which makes it detectable with a metal detector" and brings it into compliance with federal law. It also uses a metal nail as its firing pin. Note, though, that the six ounce chunk of steel is non-functional — meaning that someone following Defense Distributed's lead might adapt the instructions to do away with that insert. Does it worry you that a gun can be made with a 3-D printer?